Today’s Friday focus is Jason Bougger, author of YA, horror, and science fiction short stories and novels. Jason Bougger is a writer living in Omaha, NE. He is the author of the YA novel Holy Fudgesicles and has published over twenty short stories. He blogs daily at Write Good Books and is the editor of Theme of Absence, an online magazine of fantasy, horror, and science fiction. His debut novel, Holy Fudgesicles, was published by Wings ePress in May 2015. It’s a paranormal YA novel following a teenager who returns from a near-death-experience with mystical healing power. When I was sixteen, I stood on an assembly line 40 hours a week watching onion rings go by making sure they weren’t touching before the breading comes on. It smelled bad and was quite tedious. But I still took pride in the job. It was really cool to get those paychecks. It also taught me how to “write” in my head. I’m working on cleaning up the first draft of my second novel, a YA fantasy tentatively titled Heroes of Eden. It’s a fun book so far, completely different than my first novel, but needs a ton of work. I’m hoping to have it ready to query for a conference in September. 3. What was your attitude towards reading when you were a kid? I never enjoyed reading in junior high, and assumed that all books were boring and terrible until my best friend told me that the books he read “for fun” were nothing like the stuff we were forced to read in English class. He told me about a scene in Stephen King’s Cujo, so i gave it a try and was hooked ever since. 4. If you could pick just one book to read for the rest of your life, what would it be and why? Can I cheat and pick a series? If so, the Quintara Marathon, which is a three-book space opera by the late Jack L. Chalker would get my vote. If not, The Stand by Stephen King, if only for its length. I’ve been to the Vatican, but didn’t get to meet the pope. I’d like to do that sometime. I’d also like to meet Stephen King. And Roger Waters. 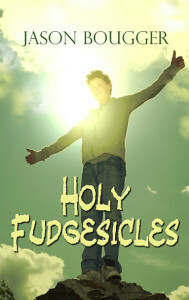 Holy Fudgesicles is available now through Amazon, Smashwords, and Wings ePress.